Question: Can we depict our three-hour morning lesson as one big prayer that includes 612 commandments? We are constantly turning between them in order to come to the commandment of love for our neighbor. Answer: Yes, consistent fulfillment of the commandments means that we climb the degrees of Jacob’s ladder. The constant expansion and deepening of egoism in us happens to ensure that we implement connection with each other at greater and greater levels. Every time egoism increases, we perform the commandment of connection on it, up to the love for each other. Question: Are there 613 commandments at each degree? Answer: Of course. But we don’t need to consider this because we are originally created this way; our soul’s vessel consists of 613 parts. In performing 612 advices (Eytin), I receive the influence of the upper Light, which corrects me. It is called Pkudin (from the word “Pikadon – deposit”). In this manner, I constantly fulfill and correct, and again fulfill and correct. Question: Does the division between 612 commandments and the 613th commandment also exist at each degree? Answer: Yes, because the 613th commandment does not exist on its own, I am incapable of fulfilling the commandment of love. I cannot be forced to love the other. If I, by fulfilling 612 commandments, receive the upper Light upon my desires, then I become loving and bestowing. A kenes (convention) is a kinus (gathering) where we want to be in the sensation of a single system, and the feeling of that gathering depends on the extent to which each one gives strength to it and acts in connection for everyone, then everyone receives the reward from that. I don’t think the daily lesson covers the congress, both in terms of the quantity and quality of people participating, and also in terms of us not scrutinizing the things as we do in a congress. In a congress, we act only in a positive way to increasingly awaken unity, whereas in our daily lessons, we have the line of criticism. That is the main difference between a lesson and a congress. Other than that, in a congress, there is a gathering in quantity, not just quality. You have many people gathering together for two to three days in an effort. We will see how we can activate that effort in a virtual congress. On one hand, there is this direction to connect, and on the other hand, it is all more internal and virtual. Where Did The Congresses Come From? (September 13, 2018 / JNS) “I wish all my Jewish friends in Iran and Jews worldwide a very happy new year filled with peace and harmony,” said Iran’s Foreign Minister Mohammad Javad Zarif. “Despite all the challenges the Jewish people have faced, their strength and perseverance continue to inspire us all,” U.S. President Donald Trump tweeted. 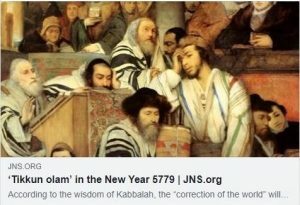 World leaders are right to shed light on the unique role of the Jewish people, and especially with regards to the concept of tikkun olam (“correction of the world”). According to the wisdom of Kabbalah, that will only happen when we first repair the relations between people. At a time when humanity’s interdependence is tightening and showing itself as the basis of all our human-made systems, there is a dire need to build new relationships of mutual consideration among all people. In fact, the numerous crises we are witnessing in all areas of life point to a terrible lack of healthy and positive connections between citizens of the world. 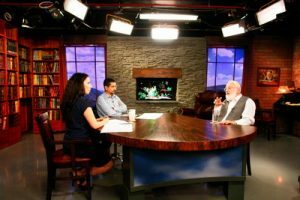 So what is the role of the Jewish people in light of today’s escalating global crisis? Some will say that the Jews are causing it, while others say they hold the key to tikkun olam. The wisdom of Kabbalah explains where both views emerge from. The Jewish people were formed as a result of the first global crisis that afflicted humanity. Some 3,800 years ago, between the banks of the Euphrates and Tigris rivers, in a desert region near present-day Iraq, humanity lived in great clans in Babylon. They lived together as kin until that relationship was shattered. The egotistical desire increased within the Babylonians, made them quarrel with one another and led to severe crises in all spheres of life. One of the Babylonian priests named Abraham wondered about the nature of the deepening social rift. He discovered that it stems from a natural and inevitable growth of humanity’s egoism. In other words, Abraham discovered that tikkun olam is nothing other than a correction of the relationship between people. He wandered among the various tribes and clans, and called upon anyone who felt the need to build a new society. The Babylonians who joined Abraham learned how to build healthy, positive and correct relationships, above the growing egoism. In time, the group grew into a new people: the people of Israel. Thus, the Jewish people were founded from a collection of representatives of humanity’s past civilization. The common denominator between them was the value of tikkun olam—the discovery of unity in diversity, and choosing mutual concern over mutual exploitation. It has a ripple effect, spreading from the inside out. The Jewish people are essentially the first circle. They are a mini-model of humanity, a model of universal connection between people. That connection is destined to spread and shape the other circles around it. At the peak of this process of tikkun olam, humanity reaches unity beyond borders, across the globe. That is, unity of the broadest circle that encompasses all of humanity—from world leaders to sheep herders in remote mountains. The correction must reach every man and woman, and every boy and girl. Everyone is equal, everyone is important; there is no preference and no discrimination. In our time, the first step towards tikkun olam is raising awareness around the globe to the need for unity. Every person in the world must recognize the natural, integral system that binds us and requires us to be considerate of each other. The Jewish people carries the idea and must reawaken it. Its role is to be as “a light unto the nations,” by being an exemplary society. Today, the nations of the world also have a duty to awaken the people of Israel to its role as a catalyst for tikkun olam. And just like the cordial greetings of leaders around the world, it is better to experience friendly and positive pressure from the world, rather than the hateful and anti-Semitic kind of pressure. However, when it comes to tikkun olam, we should not expect salvation to come from leaders and rulers. The change will begin with the masses. It is not for nothing that the modern world became connected through the Internet. The virtual connection between millions of people enables us to raise the awareness of unity in a positive way and bring about tikkun olam in pleasant ways. When masses of people consider the value of connection, even slightly, they create a tremendous wave of mutuality and consideration. The power of connection is greater than any individual, and it enables human society to rise above its narrow, egoistic nature to discover a vast space of happiness that stems from unity. Tikkun olam begins with tikkun adam (“the correction of man”). A tiny change of consciousness in each of us is all that is needed. And if you still lack a clear call to action, share this message with everyone. All that surrounds me is a theater that exists in order to help me correct myself. Every person represents a part of my inner qualities and attributes that I have not yet corrected. The responsibility for my feelings is in my own hands even though I may sometimes feel that others are treating me badly. With good will or bad will, I shape my image of the world. My freedom of choice is to treat everything and everyone in reality as myself, with love. I must reach love for all people and for the Creator, which is the general power of nature. Correcting my relationships in this way will reveal a good, all loving, whole, and eternal world.